Twice a year, New York City hosts fashion week displaying the newest trends, fabrics, colors, setting the mood for the next season. The streets are filled with men and women dressed up showcasing some of their best street style. Photographers flock the scene to capture the best angles. It is a fun (and tiring) time of year but there is nothing else like it. I'm sharing looks from some of the shows I attended and what I feel like will be trending this Fall. I'm also sharing my NYFW looks with you and where to shop them. 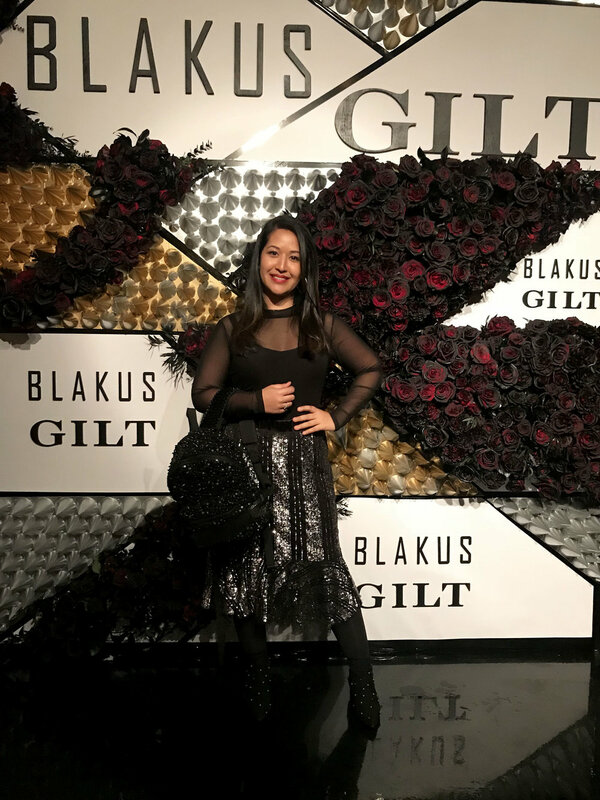 Gilt.com and supermodel Chanel Iman celebrated the US debut of BLAKUS, a Parisian accessories brand. The launch event displayed a special presentation of beautifully handcrafted small and large backpacks, crossbody bags, and a belt bag style. Each piece had amazing embellishment, using intricate beading alongside delicate studs and dramatic fringe to create unique handbags that are true works of art. My personal favorite is the belt bag with leather fringe! It is cute and incredibly easy to wear. The collection ranges in price from $710 to $2,540, and the collection officially is sold exclusively on Gilt.com. Epson hosted its fourth annual Epson "Digital Couture" Fashion event this NYFW. 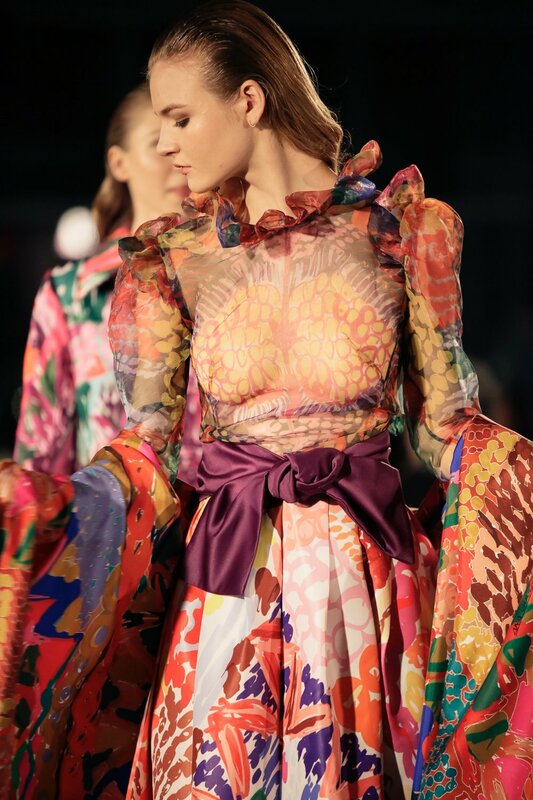 Thirteen selected designers from the Americas showcased their collections created using Epson's direct-to-garment and digital dye-sublimation printing around the theme "Cosmopolitan Couture with Impossible Colors: How Does Your Culture Dress-up?" 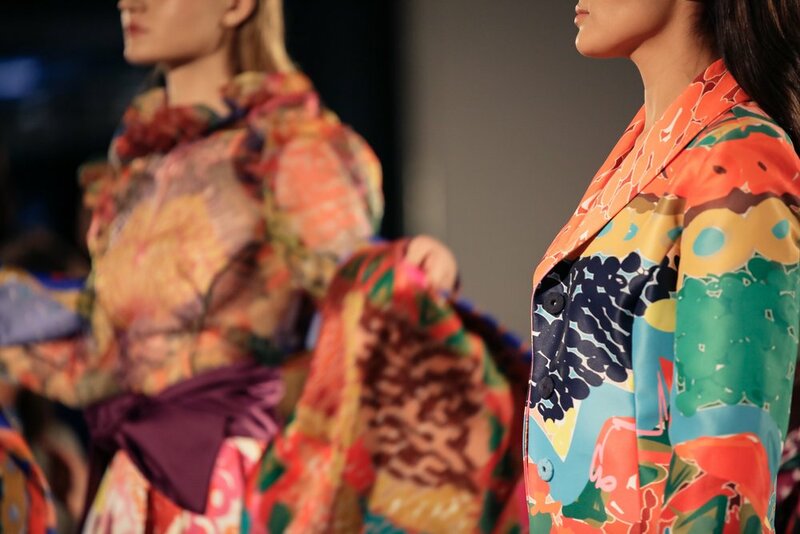 The new trend, digital dye-sublimation and direct-to-garment technologies, are allowing designers to alter textile designs, make color selections with the click of a mouse, and hone in on the fine details of their creations. As a designer myself, not having to think about the technical issues of printing give a big relief to truly be able to focus on the design itself. That is exactly what the designers did at this presentation! Each print had a story- some were bright and happy, others were mysterious and dark, others were quirky and fun. The prints truly showed the personalities of each designer and their brand. Designer Samuel Murkofsky showcased a casual wardrobe for the millennial culture this NYFW. The brand, Manhattanknights derives from and is inspired by a deep love for New York, its culture, its people and its humor. ManhattanKnights' current collection was inspired by the designers times spent in New York City at the turn of the millennium. It referenced popular styles and statements of the late 90's period but re-invented for the "now" generation. The collection looked like the current day uniform for young profeesionals. My personal favorite was the pink matching set! 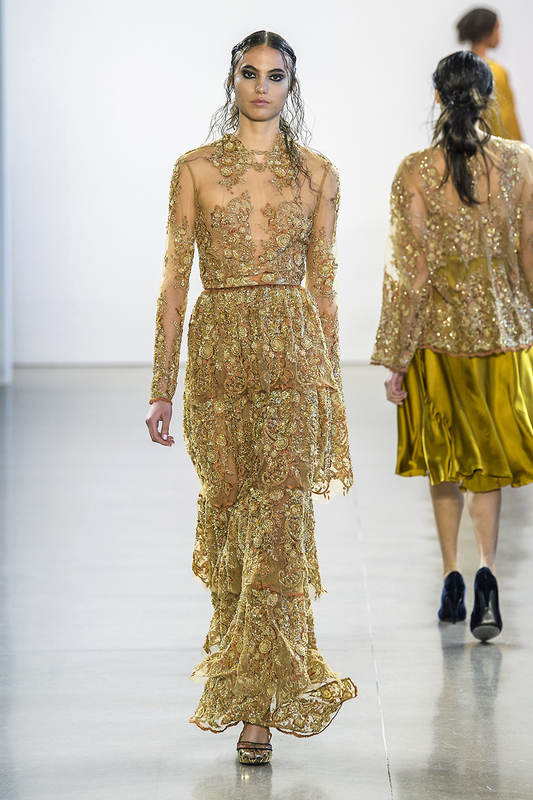 Pamella Rolland always displays the most beautiful collection during NYFW. The show never disappoints! Rolland displayed another feminine, powerful, whimsical collection. The collection was filled with rich metallic brocades, gorgeous shiny beads, fringe, feathers, delicate laceses, and flowy chiffons. I loved how gowns floated down the runway. The movement in the fabrics created great drama. The beaded fringe dresses shined brilliantly and I could not keep my eyes off the the gorgeous details. The ostrich feathers floating made me feel like I was on another planet. 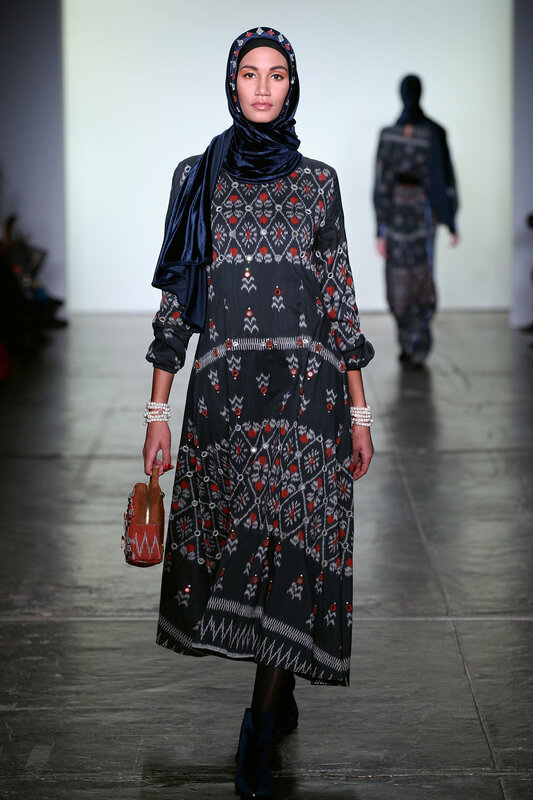 This was one of my favorite collections during New York Fashion Week! I wore a white graphic t-shirt, wool blazer, beaded tier skirt, finishing the look off with lace pumps with bow. For accessories I wore a silver reflective pair of sunglasses and crystal chandelier earrings. Shop the look below. Dan Liu presented a romantic Parisian inspired collection this NYFW. The mood was set my a mysterious James Bond in Paris soundtrack. Models wore a bold red lip with sunglasses. Beautiful shades of pink came down the runway. Pink will definetly be a big color this upcoming spring and fall. My favorite look was the off the shoulder mikado fit and flare party dress with the big bow in the back. I attended the first ever Maybelline Master Class held by my favorite beauty gurus Desi Perkins and Katy Degroot! This event was a lot of fun! They had a huge area where guests could get touch ups with Maybelline products. The master class was really cool because Desi and Katy shared some of their best makeup tips with the audience and we saw exactly how they create a beauty look. Emerging designer duo Jaxon Yang and Creative Director Nina Cuso presented their inaugural entry into the New York Fashion Week calendar with a runway show for their label, JXY n' Cuso. 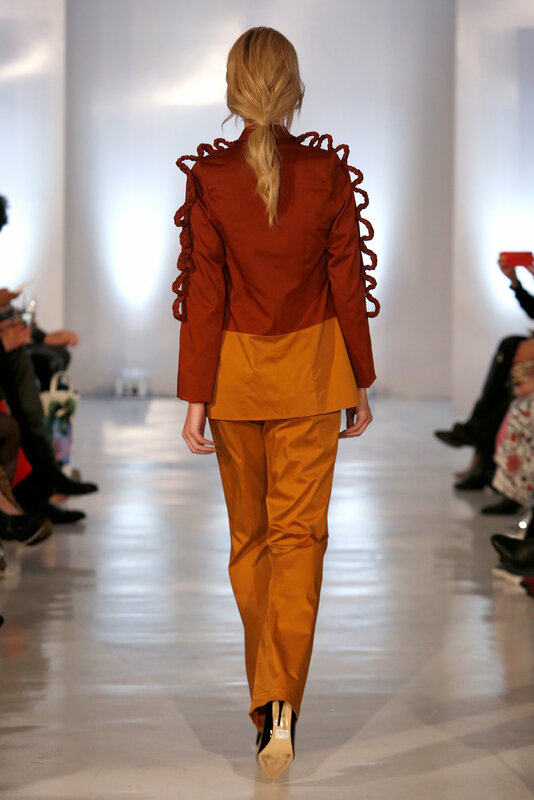 The collection was inspired by nightmares and a dimension that is unidentified. The colors used within this collection were carefully selected and are well known vessels and representatives of power, Crimson red for blood, Navy Blue for the Ocean, Porcelain White for light, and Pitch black for darkness. My personal favorite was the red leather dress. It was such a powerful look! Nandi Madida is a South African media personality, fashion designer, musician, and actress who has been captivating audiences since the age of eight. Colour. In its second year, the line has expanded and become loved by several of Nandi’s fans as well as customers worldwide. 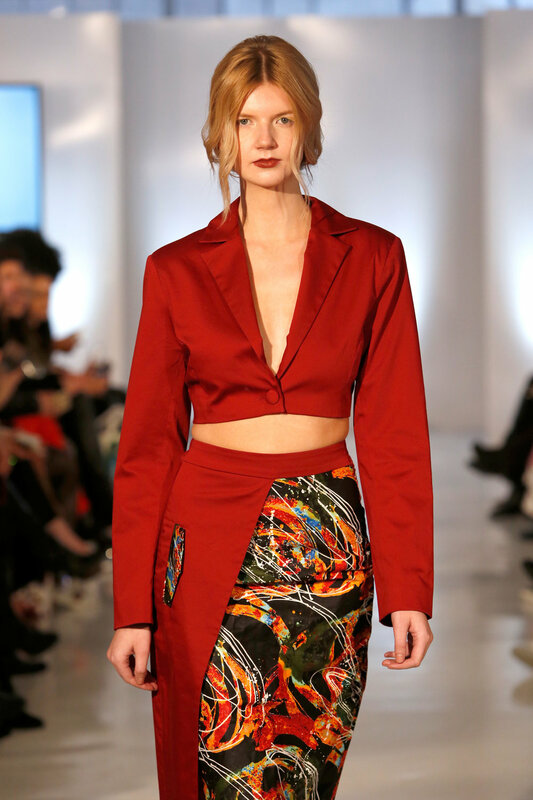 The collection displayed a bold color palette of red, rust, crimson, and black based print. My favorite was the red strapless tuxedo gown. From Overland Park, Kansas, Rachel is the womenswear designer for Rachel Pollak Designs, who loves designing classic and modern fashion. The designs appeal to a woman who is strong, sophisticated, and feminine, who loves mixing colors, patterns and textures to create a wearable statement. I loved the black jumpsuit with a pop of pink! 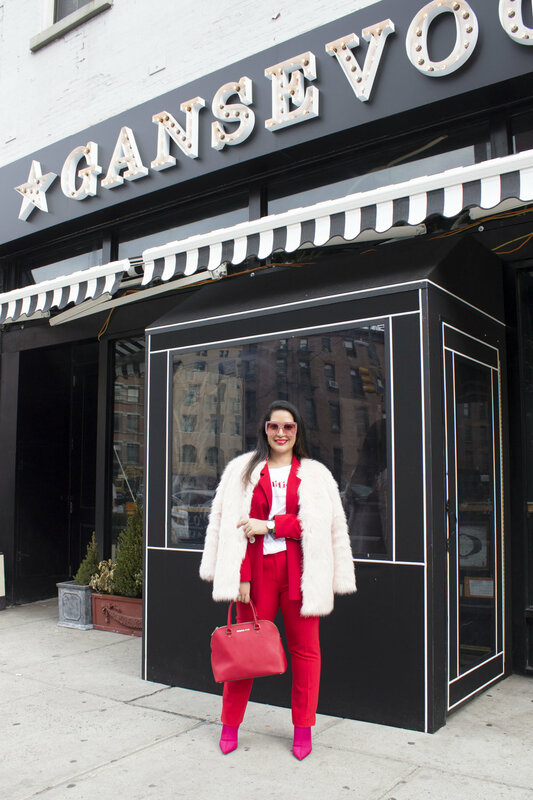 For a super busy day at NYFW, I wore a power suit. I wore a Red blazer, red pants, pink faux fur, and pink sock boots. For accessories I wore a Daniel Wellington watch, pink crystal sunglasses, red lip earrings, and a red bag. You know I love a pink and red combination! Emerging designer sisters Krystal and Marilyn Lavoie presented their Angela Mitchell FW18 collection with a presentation during New York Fashion Week. 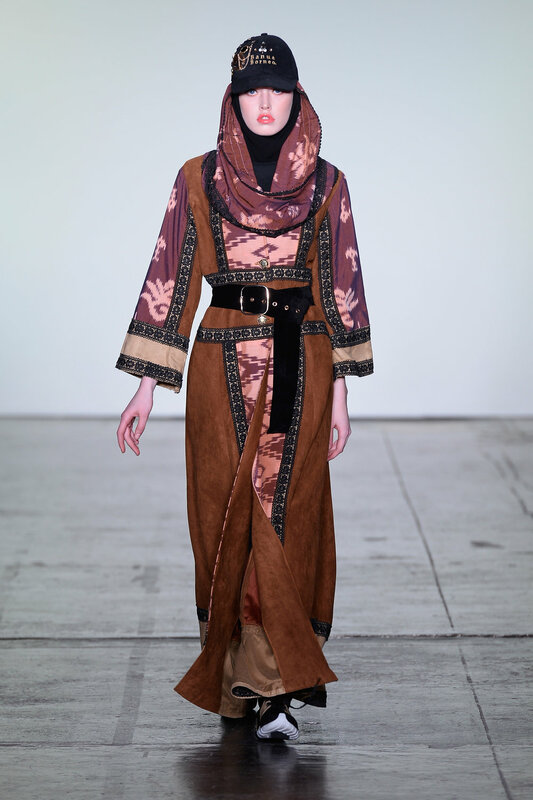 For Fall/Winter 2018, the designers have drawn inspiration from their perilous journey through Morrocco's infamous Tizi n'Tichka road, which is considered one of the most beautiful and dangerous in Morocco. 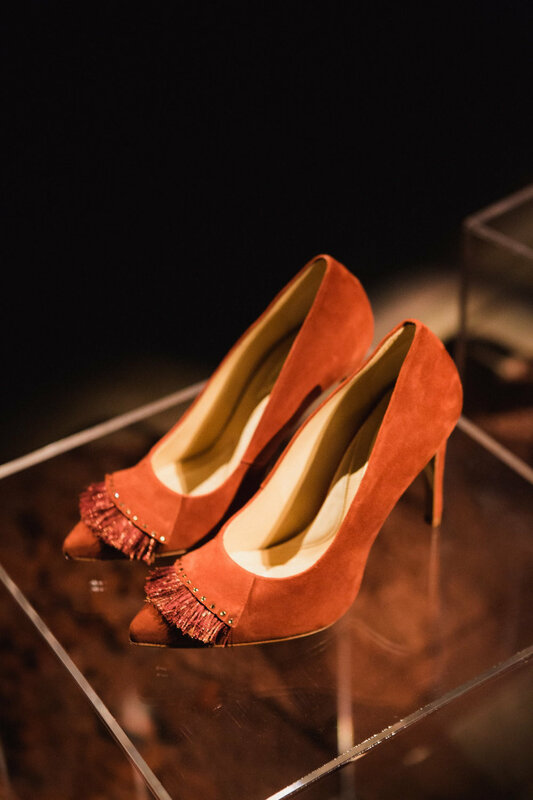 Primary colors and semi-precious jewels reminiscent of Moroccan landscapes were clearly visible in every shoe design. The women's collection offers seven contemporary and classic styles. Among the many intricately-detailed shoes, the 'Tichka' boot embellished with tribal patterns were my favorite pair! Swarovski crystal appliqués in jet, silver night, and hematite sparkle against leathers mastered by Italian artisans. On a rainy NYFW day I wore a Green stripe dress, cheetah fur coat, patent leather boot, white mod sunglasses, and floral printed bag. 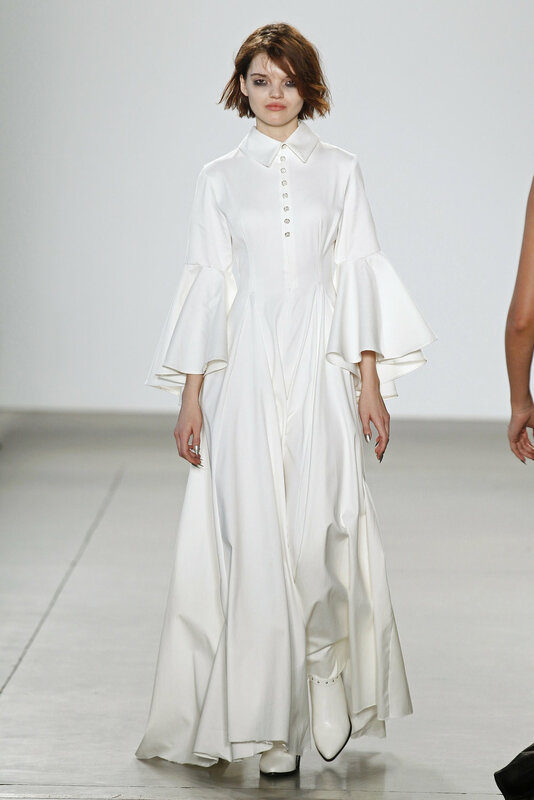 Leanne Marshall New York Fashion Week runway show brought romantic elegance with a hint of edge to Spring Studios. The collection started off displaying chunky knitwear pieces, subtly striped separates, and oversized jackets. The the mood slowly changed with a vibrant runway consisting of chartreuse, charcoal, midnight navy, dusty rose, metallic bronze, citron, and cyan. The unexpected color combinations flowed gorgeously from one capsule to the next with her signature silk chiffon silhouettes, wool shift dresses, and organic cotton outerwear. I love the details of wavy, scalloped cutouts that added a touch of drama. Each piece in the collection was crafted sustainably, whether from leftover, hand-dyed bridal materials or organically sourced cottons. The show also featured a bevy of beautiful faces in all shapes, sizes, and colors. Forty models strutted the runway, many of whom were plus sized and real sized, echoing the designer's desire to dress all women. Flaunting the beauty of every body, Leanne chose to steer away from the norm and feature fitted, body-hugging silhouettes.